Wandering is a danger that can be a symptom associated with several medical conditions. In all cases the results can be tragic. Caregivers are certainly under constant stress, with the heightened sense of awarenessa needed to protect those individuals prone to wandering. Conditions susceptible to wandering include, but are not limited to: autism and Alzheimer’s. Advances in technology have unleashed the power of GPS tracking on some very important solutions for those caregivers. Personal GPS tracking devices are now small enough to wear or care in pockets, purses, etc. A GPS device is attached to the person throughout the day. 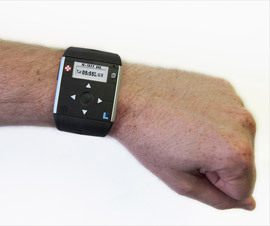 The device can be worn or carried depending on the individual situation. The caregiver can log into there PC to draw a safe-zone on a map. This zone is downloaded into the GPS device. If the wearer of the device leaves the safe-zone, the GPS device will alert the caregiver and the device’s location will appear on the map. Th caregiver can then direct people as to the whereabouts of the wanderer. As with all technology, this product is not meant to replace the vital job of keeping our loved ones safe, but perhaps it can give us a little more peace of mind that we are doing all we can. Obviously, these solutions need to be tailored to your specific circumstances, an a SHIELD life safety expert can help you navigate the availabe technologies and monitoring solutions. We also have partners skilled in the care of seniors and Alzheimer’s patients.